Will Current Houses For Sale In Tallahassee FL Overwhelm You When You Try To Sell Your Home? If you are thinking about selling a home sometime soon, I urge you to study the make-up of the houses for sale in Tallahassee, FL. It really doesn't matter what's happening in other markets, or other price ranges for that matter, the most important thing is that you know who your competition is and what they are doing to get a home sold right now. In the past, this has been very easy to do by simply running a few reports from the Tallahassee MLS, but the fact that a large percentage of your competition is distressed real estate makes the analysis much tougher. After all, if a homebuyer can save tens or hundreds of thousands of dollars by buying a short sale or foreclosure, you really have to acknowledge that the potential buyers for your home will also be looking for savings, right? In the real estate graph above, the green area shows the total number of arms length houses for sale in Tallahassee, FL while the red area shows the total for distressed. 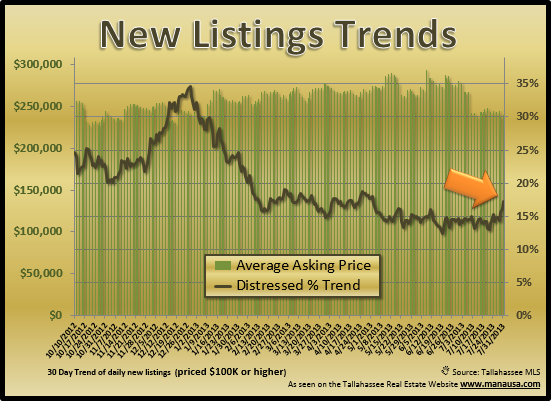 The black line measures the ratio of distressed homes for sale to all the homes for sale, and right now 31% of all listings are marked as distressed. I hope you take the time to know more about your position in the market should you decide to sell your home, and please don't hesitate to drop me a note if you would like to know what we believe your home would fetch if you entered the market today.